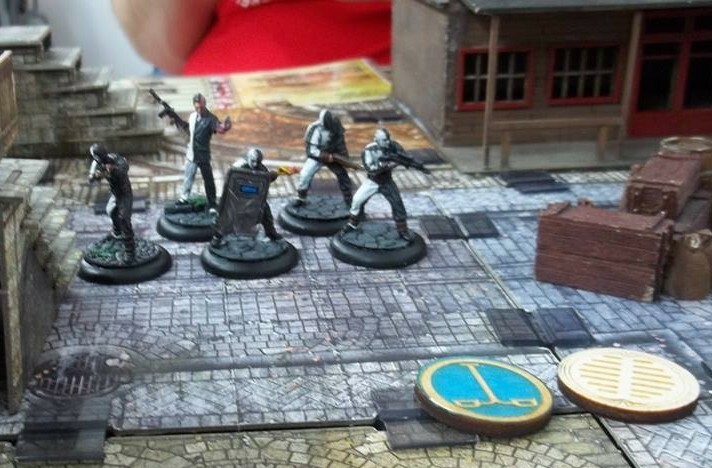 At the weekend I embarked on my first Batman 350pt tournament…indeed after only one friendly 150pt intro game! Bit of a novice, but I took the list that I was interested in and followed good advice on the forums and blogs to make sure I wouldn’t be too green. 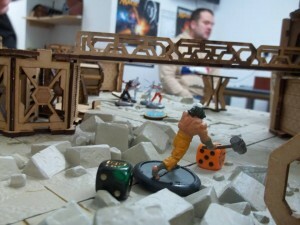 Pictures courtesy of Fistful. I’ve already laid out a general crew approach here, and would be generally following this. The only change would be using Snigger instead of Knife and Tube Clowns, trading numbers for a long-range weapon threat. This was going to be a slow but steady game as we both learnt and re-learnt the rules and procedures. Also, James using an over-sized custom two-headed coin was very cinematic! For me, I knew there were an awful lot of guns which could seriously hurt Mr Hammer so I needed to secure points early and begin to whittle down numbers, while preventing Croc from leaping out and chewing on my clowns. With the exception of Axel (Prisoner with Axe) who grabbed a loot and sat in the corner all game, most of both our forces came to fight in a narrow patch of land. 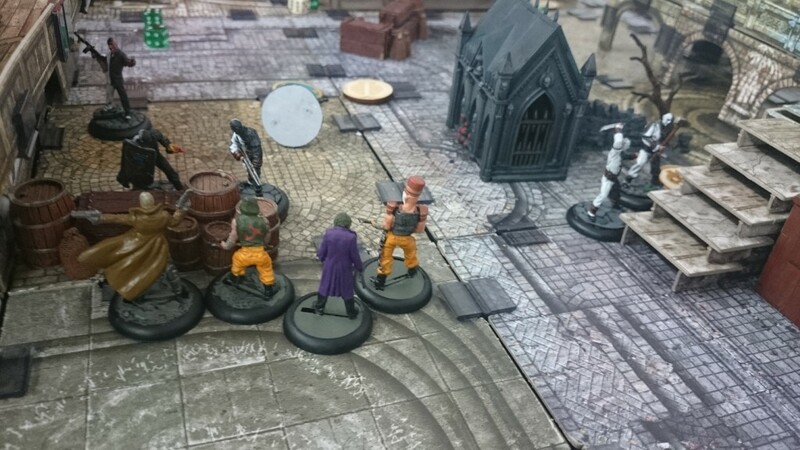 Two-face led the gunmen towards a barricade with ammo alongside, while the close-combat goons flanked through the churchyard. I had Joker in advance of my crew, swiftly followed by August and Hush. Sniggering and Master sat on an outpost overlooking the open ground, the former to shoot any henchmen under light while they both stopped Croc from coming out a sewer. Mr Hammer hid until I could get a good charge target, Clobber went for an ammo counter then crouched out of sight. On James came, with both forces striving for that barricade. A few turns of shooting and combat ensued, and I was incredibly lucky that for two consecutive rounds a Molotov cocktail burst harmlessly away from Joker and Hush. A few henchmen went down for Harvey Dent, and I nearly lost Master, Hammer and Clobber to the melee. Croc burst forth from a sewer but was too far away to do any good. In the end a close game, with time running out, it was the extra points from my Prisoner, lucky shooting and denying the ammo next to the barricade that gave me a narrow victory. A difficult game as we were both getting started with BMG, with similar lists and a lot of ground to cover as we played corner to corner. Right, so this game did not go to plan. 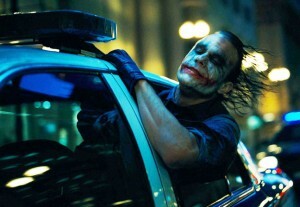 Even with Hush’s two dice to solve riddles, nothing much came of this, while Joker quickly felt very isolated. He managed to shoot up an advancing henchman before nipping away without really influencing the rest of the game. 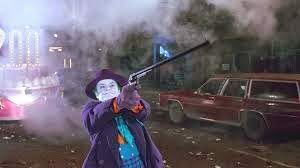 Mr Hammer advanced a little to set up a Charge… and got shot in the heart by the Joker’s One Shot Gun. Oh dear. Zsaz and Master got into a scrum in the centre, while Clobber sat on more loot. Not many casualties picked up from this, but in the end it was my early casualty inflicted and August leaping at the last into Jason’s end-zone for the ammo marker that scored me the much-needed points to claim another narrow win. This was a really good game to learn more of the rules against a similar army, and I’m looking forward to game s in the future with James and his girlfriend who is also building a BMG crew. Now at this stage I was way out of my league (pun intended!) and so we both knew despite the inevitability of the result, there was a lot I could learn. Also the random deployment of the mission didn’t favour my crew, whose strength is in combined numbers rather than penny-packets. 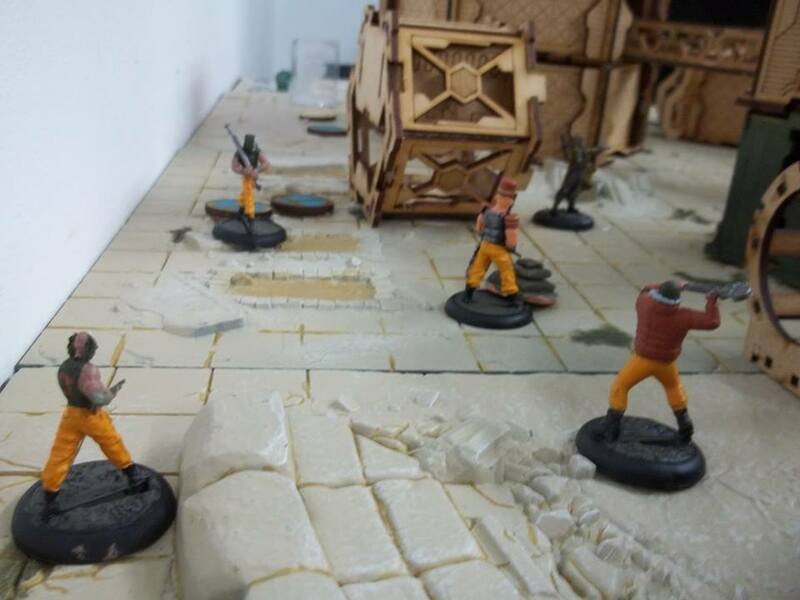 My first mistake, not knowing the rules with Ninjas so deploying out of range to do any effective shooting. Secondly, not starting with Mr Hammer swinging for Liam Neeson meant Liam came swinging for Mr Hammer. Despite not landing a killer blow, ten bloods is certainly enough to topple a one-armed psychopath from Mother Russia. Elsewhere Clobber got clobbered and the ninjas had the last laugh over Sniggering, but this left me able to secure an ammo crate first (extra points) and send in Prisoner with axe against a Ninja bowman, collecting a casualty bonus too. 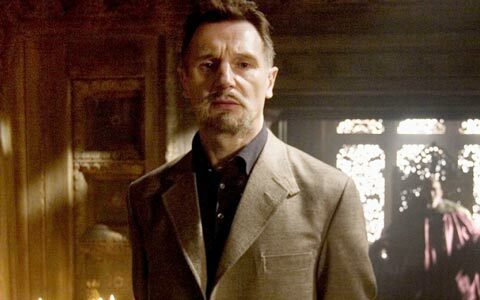 Hush was unlucky to STILL not successfully solve a riddle before dying to Liam (luck of the irish…). Heath came on and caused some blood wounds, with August finishing off a ninja and a prisoner bodyguard before I succumbed across the board to Katana’s and other deadly blades. All of this while Nyssa swung around the board rolling 1, after 1, after 1 for shooting… needs more practice. In general, hugely outmatched and certainly after losing my main close combat threat. I learned a lot about deployment, ninja strengths, best use of elites/ranged/brawling henchmen etc. etc. so give me 4-7 years practice and I think we might end up in a fair-fight! I knew from my inexperience and my average painting skills I was nowhere near top slot, but I was glad with how I performed in each game. I was hugely surprised to come fourth, missing out on third to James by a point or two (he certainly deserved bonus points for excellent paint job). I got a special edition card and Elite Clowns thanks to Knight Models, and some really useful advice throughout the event from excellent opponents and the tournament organisers. Looking at the list again, I know I need more experience to get the most out of my characters and a broader knowledge of the game to bring my best to a game. I think I need to bench Hush for now, despite the excellent sculpt and how his rules affect the pre-game I need to be more adept before getting the most out of him. 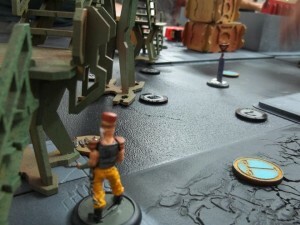 In his place I’ll send in Deadshot, to allow a mobile gun platform who can ignore terrain. I considered removing Mr Hammer for Harley due to his poor showing but I think that’s more down to my poor handling of the fella; his high endurance, movement and attack values are much needed in the rest of my crew. I want Punker, but too many points. The Gatling Brute is waaaay too many $s. 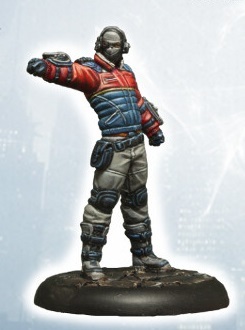 I looked hard at the Elites Borgon and Asker, but I don’t like the models and I’m not sure they fit best with my crew. I’ll be getting some Joker Gas Canisters to add an air of danger to claiming these objectives. And I never got the chance to explode a henchman, what’s that about?!?!?! Oh well, definitely hooked on BMG and will give my Clowns another shot at the title in the near future. Thanks for reading!